Numark has introduced the CDMIX USB, a dual CD player with USB ins to allow mixing from up to two USB keys. At the NAMM, Akai has introduced its new BT-100 and BT-500 belt-drive turntables. Reloop introduces the latest member of their CDJ family, the RMP-4, a hybrid player that allows for controlling your favorite DJ software. With the XDJ-1000, Pioneer removes CDs from the DJ setup so they’ll mix only songs stored on a USB drive. Numark introduced this weekend at BPM a new product range for DJs, including the NDX500 CD/USB player and MIDI controller. Pioneer officially introduces today its PLX-1000 professional turntable for DJs, which prototype had been unveiled earlier this year. 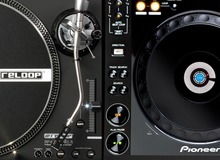 Reloop announced today that its RP-8000 turntable and MIDI controller is now fully compatible with the Serato DJ software. Pioneer did not introduce any new digital gear this year at Musikmesse, but we were surprised to see the prototype of a turntable.